Last week, artist and Heiner intern, Amy Braden and I set out armed with our cameras and a long list of local exhibitions to see. "Gallery day," as we called it, was dedicated to visiting as many contemporary spots as we could to get a better feel for what is currently being shown in and around the city. While it was impossible to make it to everything in one day, we were pretty impressed by how many spaces we were able to see. We made it to Flashpoint, Artisphere, the Arlington Arts Center, Contemporary Wing, Hamiltonian Gallery, Adamson Gallery, Transformer, Conner Smith and G Fine Art (whew)! Below are a few snapshots from the day. If you haven't made it to these places yet- go! You won't regret it. 1. Amy checking out The Salon of Small Deaths at the Hamiltonian Gallery 2. G Fine Art facade 3. Detail of a fun Megan Mueller piece at the Arlington Arts Center 4. Victoria Fu: A Cloud is Not a Sphere video installation at Flashpoint Gallery 5. Detail of a Teo Gonzales at Contemporary Wing 6. Great show of newly discovered Gordon Parks photographs at Adamson Gallery 7. Very interesting Koen Vanmechelen installation at Conner Smith 8. 1515 Fourteenth Street: home to Hemphill, Adamson, and Curator's Office 9. The fabulous Amy, navigating the city like a pro 10. Loved Patrick Berran's paintings at Project 4 Gallery 11. Coffee break at The Wydown pop up 12. 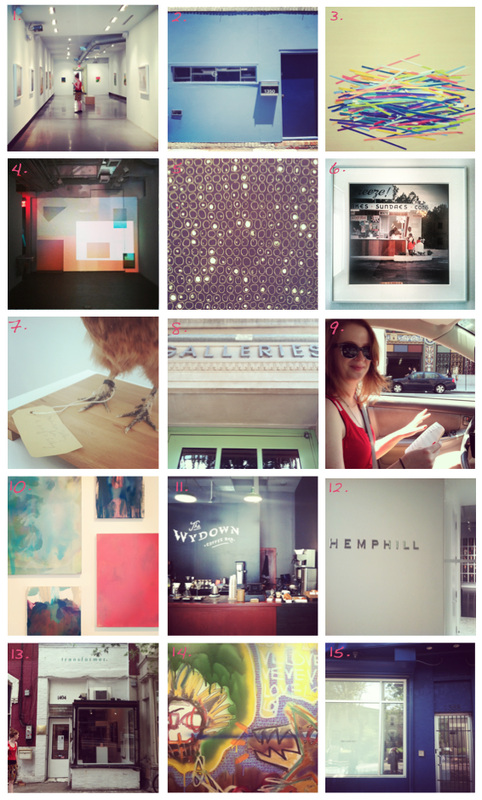 Hemphill Gallery 13. Transformer Gallery 14. Detail of an Aaron Hughes at Artisphere (!!) 15. Conner Smith.